I can't say that I'm "sad" about it; indeed, I have given away many dozens of VHS tapes to students and others—consisting of both pre-records as well as material taped off of television—the past year and a half or so, but I don’t see myself ever completely “VHS free.” I have too much rare material that simply can’t be found on DVD (at least at the moment), not movies so much as much as live TV and hard-to-find TV interviews--some of it from the late 1970s. And what's wrong with keeping some of those old tapes that have vintage television commercials on them? I simply can't motivate myself to transfer all of that old material to DVD-Rs. Ugh. 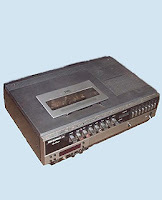 I thus anticipate the coexisting with the videocassette—both VHS and Beta (my Sony Betamax is alive and well)—for many more years. Perhaps these material artifacts of a déclassé technology will do nothing but collect dust, but the technology has been too much a part of my life to dispense with it so cavalierly.